Molecular cuisine is a culinary movement that has virtually transformed the kitchens of high-end restaurants into chemistry labs. Proponents of this cooking technique will tell you that a perfectly boiled egg must remain in the water for 45 minutes at 64.5 °C. That’s right, neither 65 nor 63, but 64.5. Naturally, it is impossible to control cooking temperatures with such precision at home, not to mention how expensive molecular cuisine equipment is. Therefore, one would be forced to go to a posh restaurant for a taste of this experience. 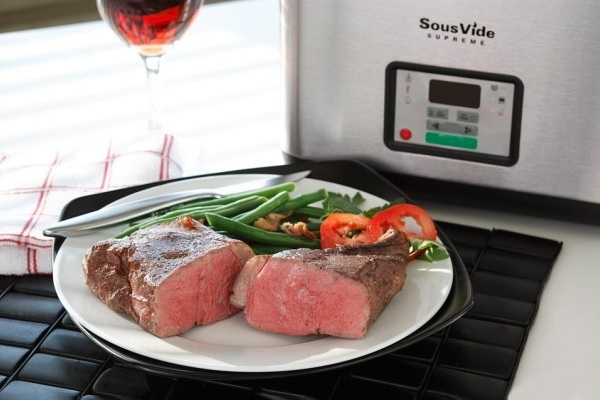 With the SousVide Supreme Water Over, you can now boil your own flawless egg without taking out your gold credit card. This relatively affordable oven (yet still priced at US $450) allows you to hold a water bath at a constant temperature for long periods of time, while your food cooks in vacuum-sealed pouches. This method is particularly effective for cooking meats to perfection every time since the airtight packaging seals in the juices. A must-try!